plan for VMware virtual machines and their data. from VMware and HP, showing the relationships and interdependencies. such as Microsoft Exchange, Microsoft SQL server, and File and Print services. HP Blade Servers, the EVA Disk Array, and the EVA Site Recovery Adapter.  Ease of operation, including tips for how to properly interface HP technology with VMware technology. Use these best practices to accelerate time to deployment, while reducing risks and minimizing total costs. concepts, and features. The following topics are discussed. alternative method for performing backups. log. Therefore, a DR group is the primary level of Continuous Access management. writes occur in the same order that the host writes occurred, this process is called merging. failure or outage occurs that may not allow an orderly transition of roles. Building an effective disaster tolerant solution can often be a very complex and time consuming task. solution must be able to accommodate both planned and unplanned downtime. result of some logical, management-initiated event. mission critical applications to a safe offsite data center, away from harm. replicated synchronously with Continuous Access. High Availability (HA) see the VMware HA Concepts, Implementation and Best Practices white paper. The following software and hardware components are used in this case study. boot from local disks or from the SAN. local storage (EVA 2) in Data Center B.
guide and the HP StorageWorks HP StorageWorks Continuous Access EVA Implementation Guide. recommendations on configuring the array properly. Exchange 2007 and the EVA array properly. workloads) and the desired RAID protection. supported RAID level on the EVA. limited by the number of disks. largest hard drive in the disk group for single sparing and four times for double sparing. 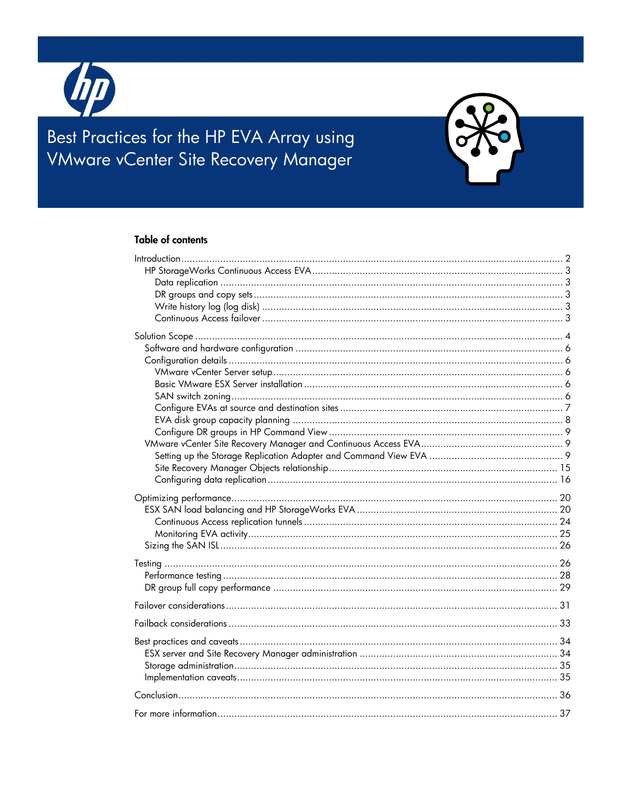 the HP StorageWorks Continuous Access EVA Implementation Guide. disk groups result in a slightly higher cost of ownership and potentially lower performance. such as database logs and rich content. created to balance the replication load between EVA controllers and Fabric ISLs. the same LUN IDs as are on the source EVA 1.
thru a software component called the Storage Replication Adapter (SRA). arrays. It provides centralized management, provisioning, health monitoring, and control of EVA in a SAN. Manager and Command View EVA. installed either on a physical machine or on a virtual machine. communication port of Command View EVA. separated with a semicolon (;). screenshots of the Array Manager window. both the protected and the recovery arrays. Figure 5 shows an Active/Passive Command View deployment. responsive, the EVA SRA automatically activates the passive instance CV-1 to manage the failover. Manager failover in test and recovery mode. The diagram in Figure 6 represents an active/active configuration in a bidirectional replication solution. managing the local array. The Site Recovery Manager Array Manager is configured to use CV1 and CV2. plan testing. Both must be installed on the HP EVA disk arrays at the protected site and recovery site. shows the licensing information reported by Command View and SSSU. configuration. These objects have a hierarchical relationship, as shown in Figure 8. Manager calculates this for you so you don’t need to figure this out manually. protection group is simply the set of VMs that sit on a datastore group that are failed over together. storage, and the protection group is all about VMs. It is made up of replicated VMs and various metadata. applies to one or more protection groups and the corresponding instructions for recovering their VMs. Recovery Plan B is used to restart everything that is protected. number of parallel startups is limited to 16 even when there are more than 16 ESX hosts. DR group represents the smallest possible granularity for failover. Note: Max number of DR groups may vary, depending on the EVA firmware. Consult the Continuous Access EVA release notes for the number of DR groups. First, a datastore spanning multiple LUNs causes those LUNs to be grouped together in the datastore group. others. VMFS 2 (and therefore LUNs 2 and 3) is alone in the second datastore group. a third datastore group because the virtual machine has a virtual disk in each VMFS datastore. server should be placed into the same protection group. random IOPS in the database to compete with the sequential streams of the transaction logs. datastore to DR group configuration. commands but cannot issue I/O commands to the Vdisk. failover. A path is defined as a connection between a host bus adapter port and an EVA controller port. Adapter and one EVA controller. executing on, storage is configured and optimized the same way. of a large number of LUNs and ESX hosts. vmhba1 for the first four LUNs and vmhba2 for the remainder. management of a virtual disk to the array controller that receives the most read requests for that virtual disk. the EVA to use the most optimized path. turn may trigger another transition eventually leading to a path trashing scenario. be used carefully as they may establish a less than optimal configuration, causing unnecessary proxy reads. to the specified destination controller through a path. This path is called a data replication tunnel (DRT). EVAs); which limits the number of concurrent tunnels to two. between a source and destination EVA. see the HP StorageWorks Continuous Access EVA Implementation Guide. tunnels. Up to four concurrent tunnels can be used between the arrays. Command View EVAPerf software tool white paper. throughput and finally derive the adequate bandwidth for the ISLs. storage was a mix of Raw Mapped LUNs and VMFS datastores. In our environment, MS Exchange 2007 and Linux virtual machines run at Site A and replicate to Site B.
groups and the recovery plans for SQL Server and File Servers from site B.
same JetStress tests are executed with and without data replication. Mapping. Table 2 shows the disk layout. recommendations on configuring Microsoft Exchange 2007 in a VMware ESX environment. logical disks in the two-hour test period. capacity of 2.2 TB. All Vdisks are configured with Vraid 1. Manager protection groups to use multiple Continuous Access DR groups. feature and the process is executed, using a recovery plan defined at the recovery site. possibly affect the recovery of the protected virtual machines and applications. VMs are running in parallel with the recovered VMs. transactional applications, such as MS Exchange, SQL server, or My SQL. to a consistent and up-to-date state. production hours to execute test failovers in environments where both sites are hosting production servers. a SQL server application located at Site B.
physical drives can exhibit more important disruption. cannot mount the mailbox databases. simultaneously to bring up the environment faster after a disaster occurs. failback is configured it can be managed and automated like any planned Site Recovery Manager failover. the most time in a failback scenario. assigned to the protected virtual machines (VMFS datastores and Raw Device Mapping). source and Site A as the destination. b. Set host presentation for all target Vdisks to ESX host(s) at Site A. Set DR group destination host access to None. 2. Delete recovery plan R1 at Site B. 4. If it is not already in place, use the VI Client at Site B to establish Site A as the secondary site for Site B. 5. Create protection group or groups P2 at Site B to add virtual machines that must failback to Site A. 6. At Site A, create a recovery plan R2 for the protection group or groups P2. replicated to Site A, execute recovery plan R2 at Site A in test mode. 8. If the test is successful, execute recovery plan R2 in recovery mode. 10. Delete recovery plan R2 at Site A. 11. Delete protection group(s) P2 at Site B. 13. At Site B, create a recovery plan R3 for the protection group or groups P3. Manager in their virtual environment. datastore, HP recommends creating a new LUN/VMFS data store and moving some data onto it. Consider using Storage VMotion to avoid service interruption. files (configuration, vmdk, and so forth).  Protected datastores and RDM Vdisks can be replicated using one or more Continuous Access DR groups. defer test activities to take place during off peak hours. both on the same physical disk can cause I/O performance degradation. use concurrent replication tunnels. Set the Vdisks PREFRRED_PATH by using Command View EVA. Multipath settings on the ESX host must be set accordingly to avoid excessive proxy reads. disk and will fail to create the snapshot when executing a recovery plan in test mode. For more information, see the VMware KB 1008283.
protection group this way could have dire consequences. Manager in conjunction with HP Continuous Access EVA and the EVA VMware Site Recovery Adapter. possible under certain circumstances for a datastore group to map to multiple EVA DR groups. the planning considerations for implementing multipathing between the VMs and the EVA array. data elements are appropriately mapped into the described hierarchies. can be mitigated with adequate disk array and server sizing. recovery plans remain fully operational. failover, a full data re-mirroring between the two sites may be required. of any VMware icon or diagram in this document imply such an endorsement. trademarks of VMware, Inc. in the United States and/or other jurisdictions.